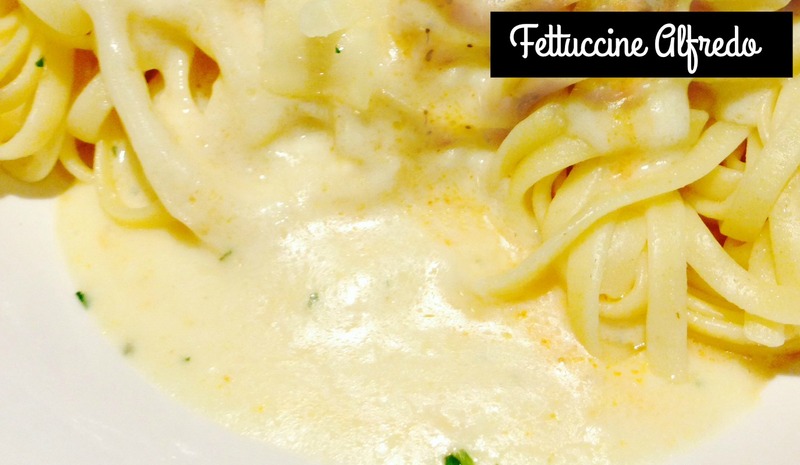 We absolutely adore Fettuccine Alfredo! (I mean who doesn’t?) I would always order it at restaurants, and before I started learning how to cook, I bought the jarred kind to try and ‘make it’ at home. Yuck. Jarred Alfredo sauce is one of my least favorite convenience foods. I soon learned how easy it was to make Alfredo sauce at home. The secret is to use shallots instead of garlic. I love me some garlic, but in Alfredo sauce, I prefer shallots! We love this pasta topped with grilled chicken, or as a side to our favorite Steak Marsala! Once you try this recipe, you will never make it another way again. This recipe makes enough sauce for 8 ounces of pasta, but can be easily doubled depending on how many you are feeding! Enjoy! Cook the pasta in a pot of boiling, salted water until al dente. Drain in a colander but reserve 1/8 cup of the starchy water. Meanwhile, melt the butter in a medium sauce pan over medium-high heat. Add shallots and saute until tender. Add heavy cream and bring to a boil. Reduce to medium and cook, stirring often, until sauce has reduced slightly, about 5 minutes. Remove from the heat and add the parmesan cheese, salt, pepper and the reserved cooking liquid, stir. Toss sauce with pasta. Garnish with parsley and enjoy!